Everyone needs some fresh air over Christmas and it really does make you feel better to get out of the house and away from the tv. This year, we'll be travelling to Durham to enjoy the Stick Man trail together, but for those who wish to visit Northumberland, here are our top picks for your Boxing Day stroll. The Hall and Cafe will be closed on Boxing Day however the grounds and garden are open from 10 to dusk. Wallington Estate is superb for children with three fantastic adventure play areas, a den building zone, wildlife hides and a lovely lake to walk around. Entrance fee's may apply. If you fancy an early morning stroll, it will be safe to cross over to Holy island from 6:45am-12:50pm on Boxing Day 2015. PLEASE check here for crossing times BEFORE SETTING OFF. 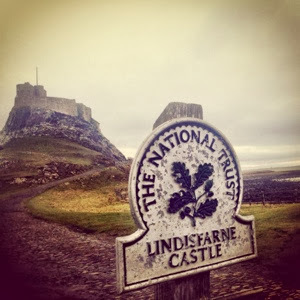 Holy island is the perfect place to escape and enjoy some time together as a family and always feels magical when we visit. Druridge Bay Country Park is home to the perfect length walk for little ones around the lake (it's around 1.5 miles). Enjoy watching for wildlife, spotting ducks and playing in the park. The beach is just across the car park too. If you don't fancy travelling to Durham but still fancy the Stick Man trail, you can also find the trail at Kielder Visitor Centre. Kielder village is a fab place to visit with the family and you can also read about stars, take part in the minotaur maze and view the castle. Where will you be enjoying a walk with the family this Christmas? We're always looking for new places to try. Make sure you follow us on instagram for where we'll be posting our Stick Man trail pics at the end of the month.